MaximumRockNRoll Review | Shocked and Amazed! Lyons Press has included 21 pieces that they deemed most representative of the six earlier issues of the “Shocked and Amazed” journal and placed them together to form the bulk of this book. However, this book should not be looked at as simply a reprint of the journals of the past. Lyons, Taylor and Kotcher have added a number of never before seen photos, an introduction and an index, as well as updated some of the interviews to create a classic of sideshow lore and legend. There are other books that cover these topics on the shelves of your local mega bookstore/Starbucks, but “Shocked and Amazed” has one distinct advantage over those titles: it treats its subjects with respect and as people, and that comes through in the interviews. When reading this book you never get the feeling that Taylor is there to exploit his subject. Instead you get the feeling that Taylor has a genuine affection for, and interest in these people and is just there to document their stories and histories. The interviews are all very well done and offer the reader a candid look into the lives of these people and performers. Taylor does an outstanding job in this book of letting his readers get a candid and revealing glimpse into the world of the sideshow. If you decide that this is a book that you should read (and it is! ), then set aside a day in which to read it, because once you open it up you’ll be hard pressed to put it down until you have devoured every piece of information contained in its pages. 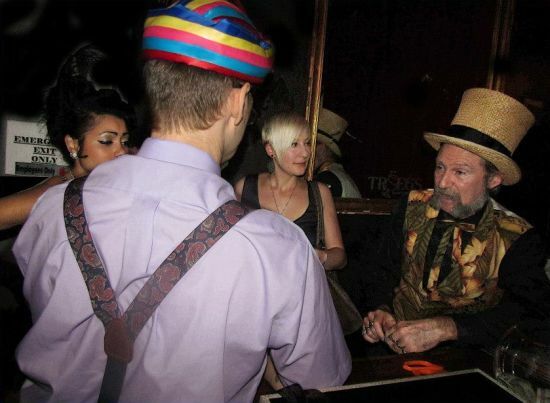 “Shocked and Amazed!” is a must have book for anyone interested in the lore, legend and myth of the sideshow.